There's a huge mistake that many club level tennis players make when they are starting to learn to play tennis or when they try to improve their tennis technique. Here's what happens: you take a few tennis lessons (or read an instructional article online or watch a DVD) and you learn some new facts about tennis technique. 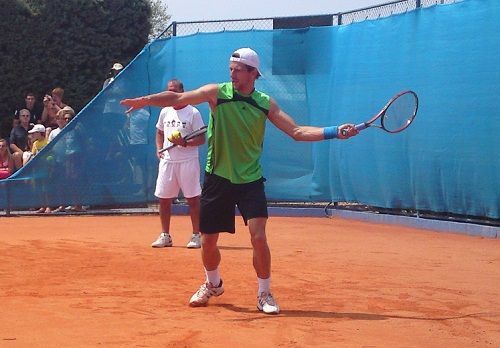 By tennis technique, I refer to the mechanics of the stroke (also called the form). Examples of mechanics (technique) would be: keeping the racquet head up when preparing for the groundstroke, tucking the elbow in and close to the body when meeting the ball, finishing the stroke above the shoulder, etc. When you learn new ideas about technique, you must, of course, consciously move your body at first. The learning process goes through 4 stages and once you learn something new, you go through stages 2 and 3. You need to repeat the movement many times before it becomes automatic and subconscious. However, this process happens with only a few players. Most club players – especially those who don't play much for points but who take many tennis lessons and mostly look to improve their technique – get stuck at stage 3 of the learning process. The reason why club players get stuck at stage 3 is because they keep thinking about technique! They cannot stop thinking about it. These people can be very controlling types of persons and cannot let go of controlling their strokes. They want to be in control all the time and simply letting go and just playing tennis is too scary for them. Other players, in contrast, simply programme their minds by thinking about the technique every time they make the shot and that becomes a part of their stroke. The mental command to move the arm or leg or hip in a certain way ALWAYS gets triggered when they are about to make the shot. Probably about the blue elephant. The same thing happens with some club players. They simply cannot stop thinking about their technique. The reason why thinking about technique hurts your game is because you split your focus into 2 parts: one part of your brain has to track the ball and calculate extremely difficult trajectories of the ball and at the same time coordinate all parts of the body at exactly the right time, so that you're able to hit the ball at the right moment and at the right place in space. The other part of the brain is now occupied by your conscious thinking about technique, which means that you've just taken lots of processing power of your brain away from the part that calculates trajectory and timing. This will almost always result in poorer timing, poorer coordination and poorer shots. You now play worse. We coaches know exactly how this process works. That's why, when we work on technique with a player, we feed balls from the basket so that the incoming ball is very easy to judge. We know that when we ask the player to focus on technique, they will inevitably track the ball more poorly than before. We also remind them of this fact and prepare them to expect more missed shots in this period of learning, when we are simply trying to make a new movement automatic. Learning of the new movement might take a few hundred repetitions or even a few weeks or even few months before it becomes automatic. We test our players by having them practice various situation drills after the technique training, which takes their mind off the technique and forces them to focus on tactics. While the player is occupied by playing a certain tactic, we carefully observe how the technique has changed from the many repetitions we did with the player. We need to see how the player hits the ball when they are not thinking about technique. This is what most club players fail to do. They are stuck in the pattern of thinking about technique and they never ALLOW it to become subconscious. Therefore, it never does. If you keep focusing on something over and over again, you don't allow it to sink into your subconscious. Your subconscious MUST TAKE OVER at some point and the sooner it does, the better it is for you – since you'll be able to play tennis freely again, without splitting your focus into two parts, which always hurts your judgment of the ball flight, coordination and timing. When you're learning a new technique, you obviously need to consciously think about it for a while. Nevertheless, your goal must be to allow your subconscious to take over as soon as possible. Therefore you need focus on technique consciously for a while and then STOP. 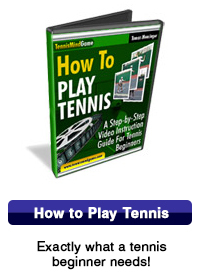 Start playing tennis by focusing on tactics – this can simply mean keeping the ball in play and looking to play the ball deep or in a certain direction or playing at a certain height or even playing a certain pattern. While you're doing this, you need to get feedback from a coach on how that new technique looks and whether it's there already or whether you'll need to think about it again later. If there's no coach, you need to be able to observe yourself – but only here and there – and see and feel whether that new movement is already there or not. If you observe yourself ALL THE TIME, you'll again be too conscious and you won't allow the subconscious to take over. You need to play freely for a few minutes, just focusing on the ball flight and tactics and then observe yourself for a minute or so to see what's going on. Then, you need to return to playing for a while, returning again later to observing and correcting yourself. The periods of observing and correcting need to become shorter and shorter and you need to focus more and more just on playing. This way, you'll allow a smooth and quick transition of that new technique (new movement) into your subconscious. You must have the end goal clearly in mind – and that is to have no more thinking about technique! You're trying to get from a place of thinking about technique to a place where you're not thinking about technique and you're simply playing tennis. How are you going to stop thinking about technique if you keep focusing on it??? You need to let go and think less and less! Let your body and subconscious take over as soon as possible. When you watch a professional tennis player (or even a very good club player) play tennis, they are NOT thinking about technique at any point during the match. Note the "perfect" forehand technique by Andre Agassi and realize that when he is hitting the ball he has no conscious awareness of his technique. He simply "wants" the ball to go towards a certain targat in a certain way. Technique simply happens as a consequence of that. Position yourself on the service line, as if you want to play mini tennis with your partner. Use only one service box. Instead of playing with racquets, catch and throw balls with your hands. The ball has to bounce once and then you can catch it. Throw it anywhere you want in the opponent's service box. While you are playing this drill, you won't be thinking about your technique of throwing the ball or your technique of catching the ball. You'll simply be thinking about tactics – where and how you want to throw the ball. This is exactly how you should really be thinking when you're playing tennis. You need to be totally immersed in the game and simply think where and how you want to redirect the incoming ball. Your body needs to move smoothly and to perform all the movements it needs so that you'll be able to achieve your tactical goal. A variation of this drill is the Catch & Throw drill, where one player plays with the racquet and the other catches and throws the ball. These simple drills will “remind” you of what it means to play without thinking about technique. Your goal is then to compare your mental state of “no-thought of technique” to your mental state when you're playing tennis and to see whether you slip into thoughts about technique. Once you learn how to switch off thoughts on technique and focus simply on playing, you'll experience a much higher level of play and at the same time allow your technique to become automatic. And that’s the only way you'll enter the “zone” and eventually experience what it means to play tennis at your peak performance.